Last month I was contacted by the folks at POM Wonderful. As it turns out, as they were cruising the blogosphere, they stumbled upon The Sensitive Epicure and since they liked my blog so much they generously offered some POM pomegranate juice to sample and familiarize myself with. I felt it was necessary to develop a recipe with it. It took a while, needing Spring to inspire me. I knew I wanted to make some type of POM gelatin recipe that was light, clean, simple, and of course gluten free and milk free. This recipe is also egg free, too. My POM Wonderfully Whipped Gelatin recipe is light, fresh, slightly sweet, with a touch of tartness. Color was another consideration of my recipe. I wanted to the appearance to match my vision of what the flavor and texture should be - light pink. One of my favorite food blogs, Khymos.org, inspired me in finalizing this recipe. My first attempt was a straight-forward gelatin, but it was a bit heavy and the color was too dark. Then I saw this molecular gastronomy foam posting by fellow chemist Martin Lersch (linked in Khymos, above). I knew I had to whip the gelatin for the recipe I wanted to create for the light results I was looking for in flavor, texture, and color. Some may look at this as new, modern "foam" but I see it as recreating something similar to what my grandmother made many years ago. Makes 10 x 1/2 cup servings. In a small/medium saucepan, combine the POM juice with the water over medium-low heat. Add in the gelatin with stirring. Simmer until dissolved, about 5 minutes. Place into a bowl and chill until very thick. Then beat with rotary beater or electric mixer until fluffy and thick – about double in volume results in the best eating and quality flavor. Portion into ramekins, custard cups, or whatever little cups/containers you have. Place in fridge and allow to set slightly (so the garnish will not sink). Garnish the top with slices of sectioned pink grapefruit in a cute design. Cool in fridge covered for at least 4 hours before serving for best results. This past weekend we hosted some friends in from out of town. I wanted to treat them to a lovely homemade breakfast which included one of my favorite Cincinnati foods, goetta. What is goetta? It is a German peasant type of sausage that consists of primary pork, pinhead oats, onions, and seasonings like sage and bay leaf. Slicing and pan frying goetta is the best means of preparation that yields a crisp outside with the inside remaining tender. Each of the German (immigrants from the late 1800's) butchers in Cincinnati and Northern Kentucky created their own recipe, and still do to this day. Goetta is unique to only Cincinnati (proper), Newport & Covington, KY. The Cincy northern suburbanites are usually oblivious to the existance of goetta. Upon my Celiac diagnosis, I mourned for the loss of goetta. Since the presence of gluten is "controversial" in oats. After about 6 months of a strict gluten free diet, I learned that my body could not tolerate "gluten free oats", and yet I had no problem with the pinhead oats in goetta. How was this possible? Was this a Cincinnati miracle? I figured an investigation was necessary. I asked my favorite goetta artisan, Bob Lillis of Eckerlin Meats at Findlay Market, how they process their oats. He told me, "not much processing is involved. We process the oats as animal feed." Works for me! The other treat I wanted to make were 1-eyed sailors, as my mom would call them. 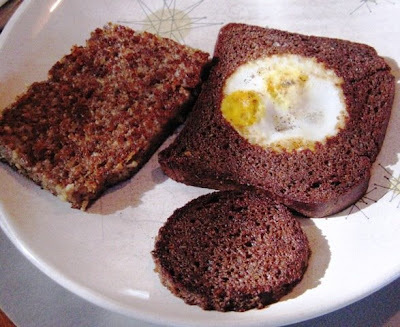 There are a number of names for this, where you cut a hole in the center of the slice of bread and fry an egg in it. I found another good GF bread at Whole Foods, Kinnikinnick Brown Sandwich Bread, to use for this sort of breakfast treat and it works great. I thought I would be clever and use 3 quail eggs instead of 1 chicken egg. Well, I couldn't call it a 3-eyed sailor. One of my visiting friends, originally from Liverpool, said that in England they would call these a "toad in a hole". "Tiny toads in a hole" seemed to be a perfect name for what I was making. Yum, so good! Crisp and savory goetta is a perfect complement to fried eggs in toast. Quail eggs and brown bread make it a little more special, too. Especially when this breakfast is both gluten free and milk free. Greek Easter was this past Sunday. I cooked Sunday Easter dinner at my house for a small group of us. Growing up my step-mother, Patti, was one of the best bakers I knew. Every Easter Patti would make a delicious coconut cake in form of a lamb. I loved it! This Easter I was feeling nostalgic and wanted to recreate this as my gluten free and milk free interpretation as cupcakes. Who does not like cupcakes? And it is a great means to mind your portions. There is a great almond flour sponge cake that I thought would be perfect that comes from The Food and Life of Oaxaca. I substituted light coconut milk for whole milk that the original recipe calls for. The frosting had be sweet and light; I adapted a recipe from Paula Deen's son for a 7-minute frosting, reduced the quantity in half. 7-Minute frosting reminds me of a delicious marshmallow fluff. And I added in salt to round out the sweetness and give depth to the coconut and almond flavors, with additional on top that can decorative. This recipe is guaranteed to please; it is spongy, sweet, coco-nutty, and messy! And it yields about 20 regular size cupcakes. In a large bowl, beat the egg yolks and sugar together until the mixture is thick and lemon-colored and falls from the beaters in a ribbon, about 3 minutes. Sift together the almond meal + cornstarch/tapioca + salt. Beat into the almond mixture alternately with the coconut milk, in three additions. In a separate, deep bowl, beat the egg whites to stiff peaks (make sure you are using clean beaters and there is no trace of egg yolk in there); fold gently into the almond batter. Portion the batter into the cupcake foils, about 3/4 full. Bake for ~ 17 minutes, or until a toothpick inserted into the center comes out clean. Place sugar, cream of tartar or corn syrup, salt, water, and egg whites in the top of a double boiler. This can be make-shifted using a mixing bowl over a saucepan. NOTE: Do not attempt to replace coconut milk for the water => the fat in the coconut milk will prevent the frosting from whipping up. Beat with a hand-held electric mixer for 1 minute. Place pan over boiling water, being sure that boiling water does not touch the bottom of the top pan. Beat constantly on high speed with electric mixer for 7 minutes. Beat in vanilla. Frost the top and sides of the cake. Sprinkle top and sides of each cupcake with coconut. Finish the cupcakes with an addition sparse sprinkling of salt of your choice or what you have on hand. To me, a classic lunch combination is grilled cheese sandwich with tomato soup. To some it may seem too adolescent, too gluten filled, or just too plain for a developed, sophisticated palette. I beg to differ. Just as Mac-n-Cheese has seen a gourmet reinvention as seen by the single theme restaurants that only serve Mac-n-Cheese in NYC with anything from bacon to truffles to pump it up. I think it's time to upscale and de-gluten the grilled cheese and tomato soup. First step - find a decent gluten free bread. I have not had time to work out a recipe for gluten free bread, so decided to try what is available in the freezer section at the health food store. An attentive employee guided me to the Glutino Premium Harvest Corn Bread as the most popular bread with their customers. At first I was worried that the bread would have a heavy corn flavor but saw the top ingredients were corn starch and tapioca starch. Both of these are very light with little to no flavor. The texture was a little dry, but in a fine powder sense, not gritty. Considering this bread was to be filled with melted cheese and browned with butter, it was the perfect candidate. This lunch had to be made within 15 minutes, so I used Pacific tomato soup with roasted red pepper. I added in a pinch of Salish salt. Any smoked salt would work. This is a great way to punch up the umami flavor. The leeks at the grocery looked so tender and were calling to me to chop them and place a generous amount in between a slice of mild cheddar and a slice of Swiss cheese. Assemble this within two slices of the buttered bread, with the buttered side out. Place into a heated fry pan over medium heat. Allow to turn golden brown before turning - about 3-5 minutes. It is better to caution on the safe side since the gluten free bread tends to brown readily, then just turn it more often. Remove from the pan and allow to rest for one minute so it sets up a bit without oozing too much while cutting. I prefer to cut my grilled cheese into strips for dipping. This bread worked really well with a great texture, mild flavor, and the bottom side even got that slightly moist texture. I am so happy it is officially grilled cheese month! When I was first diagnosed with Celiac Disease and DH, my dietitian and doctors told me that it is critical for me to abstain from gluten or face the chances of developing lymphoma, cancer, etc. My first reaction was: No goetta? 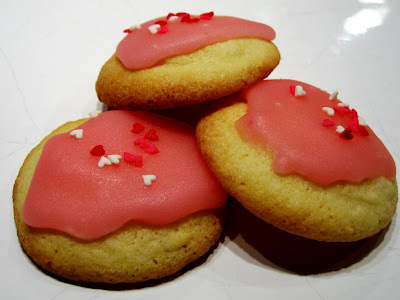 (to be blogged about at a later time) No Busken's Iced cookies? I am a Cincinnati girl, through and through. I grew up in the neighborhood of Hyde Park, where Busken's 24-hour main bakery resided. True Hyde Parkers could smell their baking schedule by walking or driving by. My personal favorite was always their iced cookies that they seasonally changed the decorations, but the recipe always remained the same. This cookie, seemed to be baked around midnight. Therefore after the bars closed was the perfect time to score these iced cookies freshly prepared, I would call "yum-yum cookies", when they were still moist and cakey with a tender crumb. There is a distinct fruity marzipan character and texture to the cookies. The icing is a simple, heavy glaze.